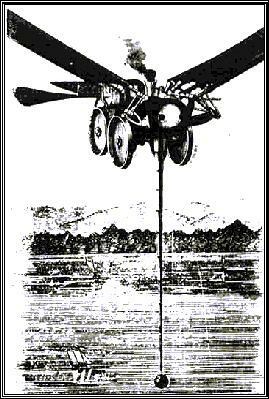 In 1867, Joseph Kaufmann, a mechanical engineer from Glasgow, designed a steam-powered flying machine. Unlike other inventors of the time who were mainly experimenting with lighter than air forms of flight, Kaufmann came up with a more unconventional method. He proposed taking to the air in a 40 horsepower steam engine weighing-in at 5,250 pounds. The steam engine was to be used to drive a pair of 35 feet long wings in a flapping movement similar to a bird. A large ball was suspended below the aerial machine with the intention of keeping it horizontal during its flight. Kaufmann predicted that it would reach a speed of 56 miles per hour carrying three gondolas for passengers. Kaufmann realised that the main problem was getting the flying machine off the ground, and his invention was fitted with steam operated telescopic legs that shot out when it was turned on and made it leap into the air. He presented a lecture on his experiments to the Glasgow Mechanics Institute in 1869 at which he demonstrated a working model of his aerial locomotive. A contemporary description of the demonstration noted that: "the model was constructed to prove the practicability of obtaining that indispensable combined oscillating and screwing motion of the wings without which the act of flying could not be effected. At the last trial this machine was strapped down to some heavy planking and loaded with a considerable weight to prevent its moving, while the wheels were kept off the ground by means of supports. The experiment lasted but a short while, on account of the great force applied, the wings after some furious strokes giving way to the strain." Kaufmann expressed his intention to construct a full size machine of sufficient power to carry several passengers "over land and water irrespective of wind and weather". This seems optimistic in view of the damage to his model in the trials and no further news of Mr Kaufmanns's steam flying machine is reported.